KUALA LUMPUR: The word crisis connotes danger and opportunity in mandarin. A market swarmed by sellers has given the Employees Provident Fund (EPF) the opportunity to be aggressively buying into stocks that appear to have been oversold and are fundamentally strong. The statutory fund had been raising its stake in a number of blue chips, including plantation stocks, from Oct 28 to Nov 10. Notably, it emerged as a substantial shareholder in Kulim (M) Bhd after buying a total of 15.78 million shares between Nov 6 and 11 in the open market, giving it a 5.12% direct stake in the plantation company. The fund raised its shareholding in Tenaga Nasional Bhd to 635.14 million shares after buying a total of 14.56 million shares between Oct 28 and Nov 4, raising its stake to 14.65%. Sime Darby Bhd, whose shares had been seeing a selling spree lately following the fall in crude palm oil price, saw EPF acquiring 10.31 million shares and lifting its stake to 935.04 million shares or 15.56%. 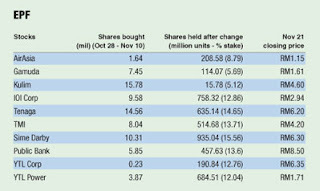 EPF took up a total of 9.58 million shares in IOI Corporation Bhd between Nov 3 and 10 via portfolio managers. It now has a total of 758.32 million shares or 12.86% stake in the plantation firm. Among other counters, EPF was also a net buyer in AirAsia Bhd, Gamuda Bhd, TM International Bhd (TMI), Public Bank Bhd, YTL Corporation Bhd and YTL Power International Bhd. Analysts said investors wanting to follow EPF’s lead in the market needed to have the appropriate risk appetite, the willingness and financial capabilities to stay invested for at least the next two years in order to reap the upside potential. Jupiter Securities Sdn Bhd head of research Pong Teng Siew said EPF’s buying into the current bleeding stock market gave an extra bit of assurance to investors to put their money into the local stock market. Pong also warned of a huge correlation between the Kuala Lumpur Composite Index (KLCI) and the Dow Jones industrial average, as the local index had been moving almost in tandem with the Dow recently. Nevertheless, Pong said he was hopeful that the local index would be able to disengage from the Dow based on the performance of the KLCI last Friday. The index closed 1.56 points higher at 866.88 last Friday but is down 492.97 points, or 36.25%, from 1,359.85 a year earlier.